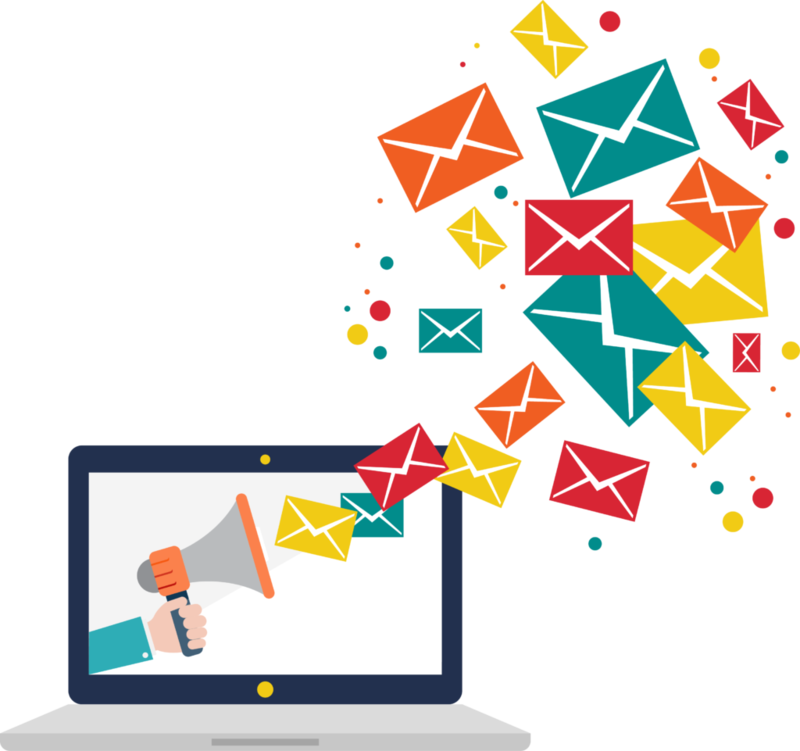 To market to your email database at your whim, without paying large sums of money for digital advertising, requires growing a substantial email marketing database. But how do you get a large database? First, you can load your existing customers or patients to your email database. But then you must, on a daily basis, continue to passively grow that database. When getting started, yes, you could grow that database with digital or other types of advertising. But from the start, your goal should be on reducing your dependence on digital advertising by capturing as many consumers as possible through 1) optimization of your website and through 2) organic (non paid) activity on social media. Optimizing your website “simply” means adding fresh content to your site on a weekly basis. This can be done with blogging. Blog about treatments you perform or interesting questions patients have asked you. Blog about the state of healthcare in this country. The point is, by blogging, something that costs nothing, you can increase visitors to your site. Once they arrive on your site, you need to capture their contact info to passively grow your email database. But more on how to do that in a moment. When it comes to social media, we are constantly feeding the social media beast with more and more content. What do we have to show for it? How often do you actually find out the contact info behind the social media handle? Do you know who @gayleprettylips is? Do you know who @sexycajundiva is? Probably not. 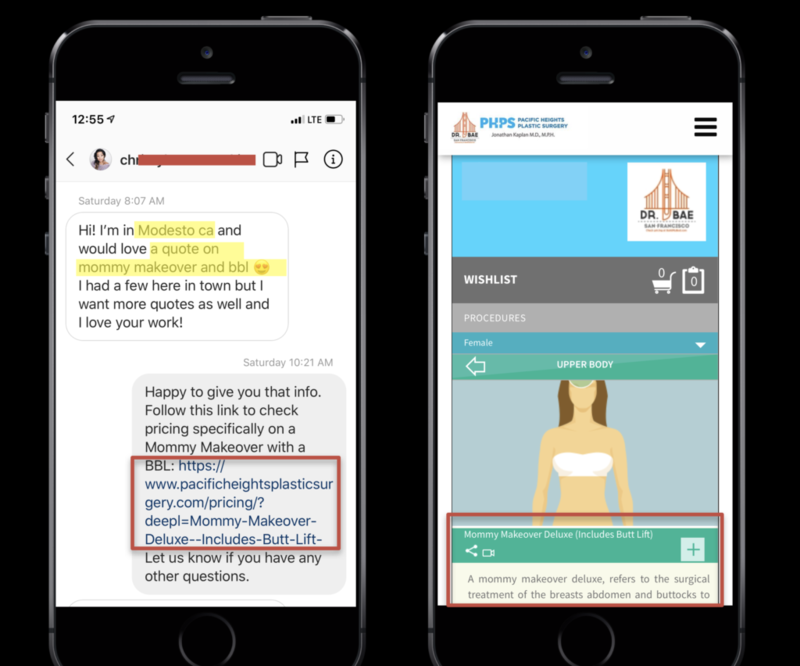 So just as you want to capture the contact info of the consumers on your site reading your blog, you want to capture the contact info of your anonymous social media followers. There’s one great way to accomplish this. Whether it’s readers of your blog or social media followers engaged with your content, when it comes to cosmetic or medically necessary services, there’s one common question everyone ultimately has…how much does it cost? Certainly when this question is asked, you could just respond with a dollar figure or a range. But once you “give the milk away for free,” you’ve given up a great opportunity to capture the consumer’s contact info. If you direct the consumer to a Price Estimator on your site that allows them to check pricing automatically, but only after providing their contact info, you’ll start passively growing your email marketing database. And growing it fast! Dr. Jason Hall, a plastic surgeon in Knoxville, Tennessee has used his Price Estimator to capture almost 3,000 leads (2,964 as of this writing) through this one lead source. Certainly there are other “calls to action” that will capture consumer contact info, as discussed in this Modern Aesthetics article, but none are as tantalizing as the offer to provide pricing information. For example, compare “Download our eBook” or “Sign up for our e-newsletter” to “Get A Quote Now.” The latter is much more useful to the consumer than the former. As you can see in the video below, Dr. Rich Castellano uses Facebook Live for filler demonstrations. In the video, he’s asked how much the treatment costs three separate times. Instead of just offering a number, he directs the consumer to the Price Estimator on his website so he has a better chance of capturing their contact info, and building his database in the process. My practice receives questions daily through Instagram Direct Messages regarding price. Similar to Dr. Castellano, we direct the consumer to our Price Estimator. But we do one better. As you see in the image below, we provide the consumer with a clickable direct link in our response. So when they click that link, they’re taken directly to the specific procedure in question, rather than just sending them to our pricing page and requiring them to find the procedure they’re looking for. By placing them one step closer to their answer, it’s placing us one step closer to capturing their contact info when they submit their “wishlist” to check pricing. When advertising on Facebook, you don’t advertise to all 2 billion users. You select the geographic area you want to advertise to. You select the age range and other demographics. But what’s fascinating is that even with Facebook’s huge trove of consumer data, you can’t actually select for the demographic that’s interested in cosmetic or other specific healthcare services. As shown in the ad builder screenshot below, you can only approximately identify your target demographic’s interest. For example, if trying to advertise to someone interested in something as broad as cosmetic surgery or as specific as a facelift, you can’t do either. The best you can do is advertise to someone interested in health and wellness or fashion and beauty. Sure, there may be some crossover but this clearly demonstrates why your own growing email marketing database is better than what Facebook has to offer. The estimated reach of the potential ad above is 3,600 to 9,600 people that may or may not be your target. If you have an email marketing database of over 9,100 people (as I do) that are clearly interested in my services (because they submitted pricing inquires for services I offer), then my database is more useful that what I could target through Facebook. Stop relying on platforms that only allow you to approximate your target audience. With an email marketing database filled with consumers inquiring about pricing on specific services you offer, you know you’re targeting the correct demographic. 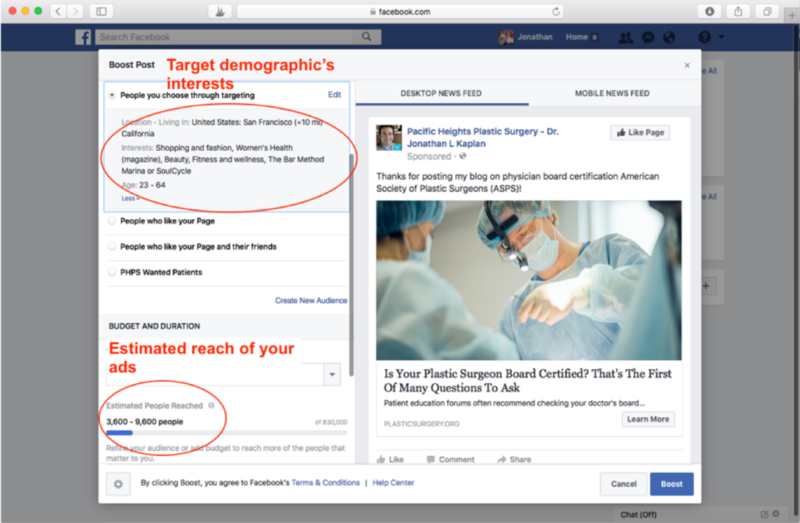 And not only is your targeting better than what Facebook has to offer, it’s substantially less expensive. So what are you waiting for? Start passively building that email marketing database! This entry was posted in Practice Management and tagged BuildMyBod Health Price Estimator, Lead Generation, price transcarency, sales funnels by Dr. Jonathan Kaplan. Bookmark the permalink.